Qualcomm may be producing one of the most advanced chips for mobile devices on the market today, but that doesn’t mean they can’t combine modern technology with some old school videography to produce a unique way to show off the power of their chips. 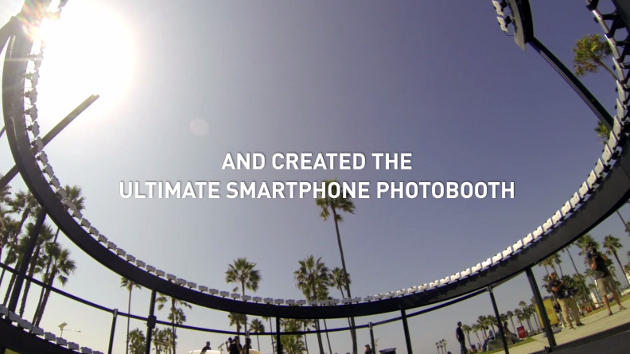 Their most recent example is a slow motion rig that utilizes 130 HTC One smarphones mounted on a circular track dubbed “The Ultimate Smartphone Photobooth” to produce a “bullet time” slow-mo effect. When the movie The Matrix was released, one of the most powerful bits of special effects was “bullet time,” a combination of slow motion and a rotating view to provide a unique perspective on an event like a character dodging bullets. The effect had actually been around for some time prior to The Matrix, but the movie’s effective use certainly propelled it into the collective mainstream culture. Today movie makers are able to bring a wealth of computer resources to the table to help create these bits of movie magic, but in the past they achieved similar results by mounting a bunch of cameras in predefined locations and setting them to fire off at once or sequentially depending on the desired effect, then stitching the images together. This “old school” method of mounting a bunch of cameras is what Qualcomm did in this instance with the HTC One cameras mounted on a rail that goes around in a spiral centered on a small stage. They then had people step into the ring to provide a little performance before applying the “bullet time” effect to activity. You can check out the results in the video below.